As most of you know...because I am a week late in getting here...Tim has decided to retire the 12 Tags of Christmas, :0( and instead do a tag a month and call it 12 Tags of 2012 :0). I love this idea, although I will miss all the action at Christmastime, but maybe now I can finally get Christmas cards accomplished. I managed to get the February tag accomplished though, and that is saying something considering how I still feel...terrible! My sinus and cold problems tend to linger due to a nasty deviated septum...too much information? Sorry!!! I am looking forward to once again seeing tags from all over the world...thanks InLinkz, and thank you Tim!!! 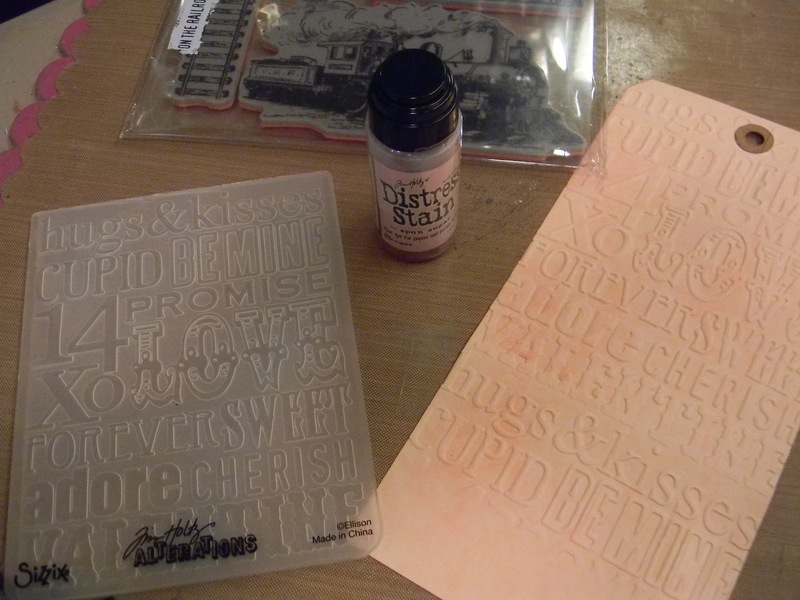 I have the Cupid die and was just about to use it, but then the doorbell rang and the postman was delivering my new stamps. I opened them up immediately, and the second I saw the train, I started singing "Love Train", so I scratched the cupid and opted for the train. It puffs hearts instead of smoke! I love this stamp!!! I stained the tag first with Spun Sugar. 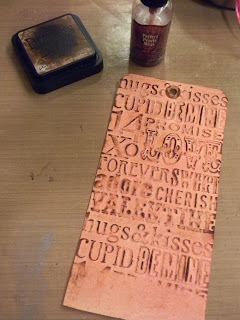 Since I like using a jumbo sized tag, I had to emboss this twice with the texture fade, but I left some space at the bottom to stamp my railroad tracks. 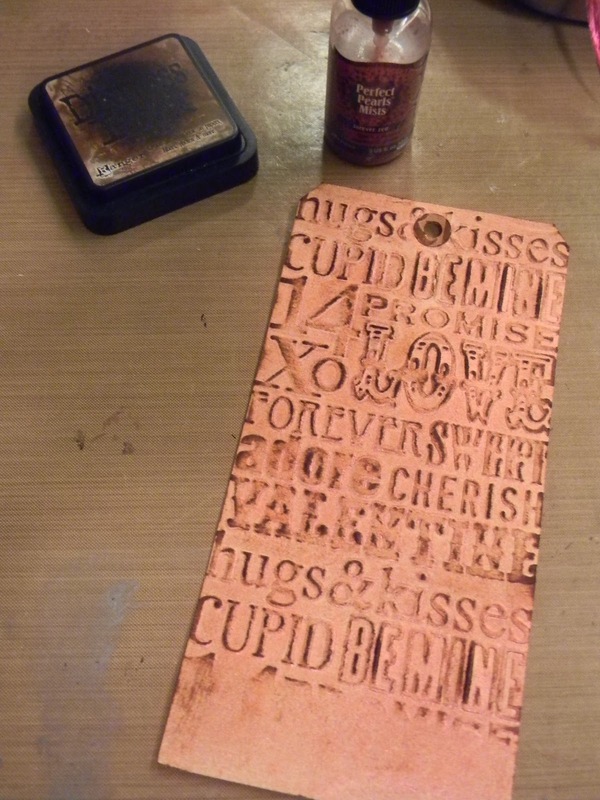 I gave the tag a few coats of Forever Red Perfect Pearl Mist for added contrast and shimmer, then ran the surface of a Walnut Stain pad over the tags raised images. I did not have any honeycomb paper (on my list now) so I had to improvise. At first, I tried making my own from some instructions online, but I had no patience and gubbered it all up, so I had to make a new plan. I had a scrap piece of grunge of a not so perfect heart, so it was just right to cover up with tissue tape (shown below). 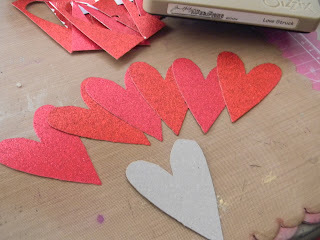 I die cut 6 hearts with glittered paper. I folded the hearts in half length wise and adhered them back to back. 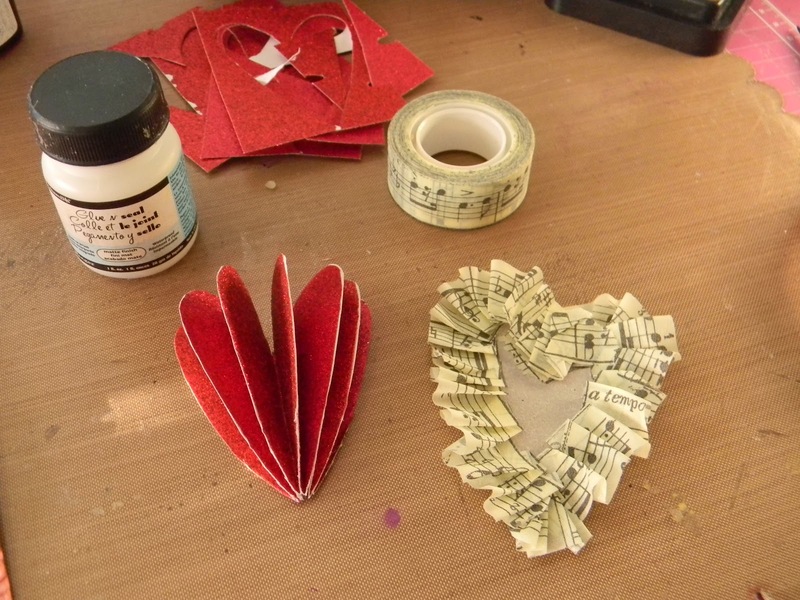 I inked the sides of all the pieces and then adhered the fanned heart onto the tissue taped heart. It's not even in the same field as Tim's, but it's 3D, and that is basically what I needed anyway. This is great! 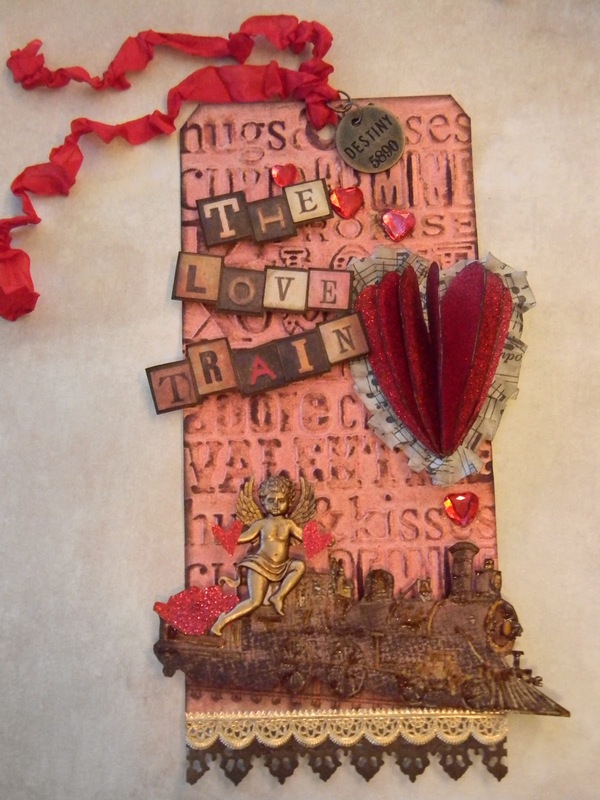 I love your take on the challenge ... the "Love Train" is awesome! And that l'il cupid hitching a ride is just fabulous, Anita. Wonderful texture on your Tag Anita, I think your elements are great, it is always so rewarding to make up your own, it makes it more personal, your heart is lovely as are the words, well it is all very lovely. What for a wonderful Tag Anita.I love it. How great having Cupid ride the love train! Your heart is great, Anita. Hope you feel loads better soon! 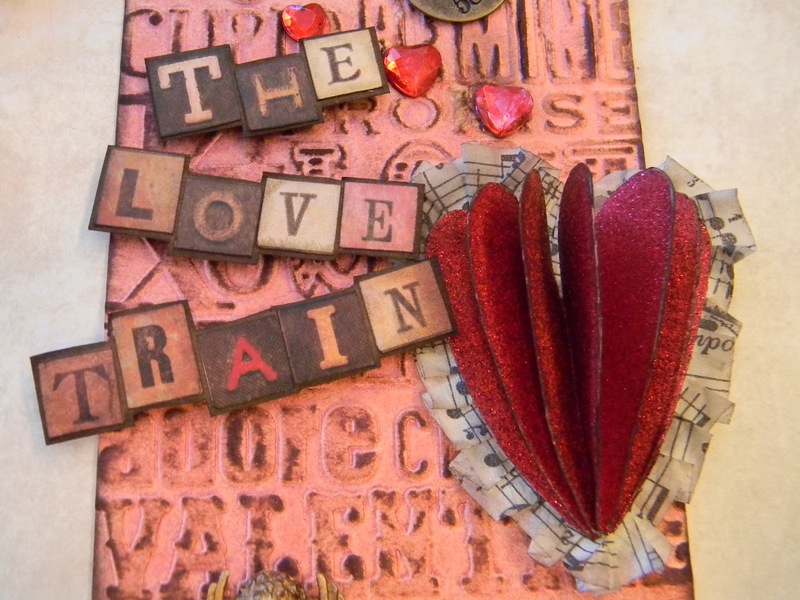 Very cool tag, love the love train theme! 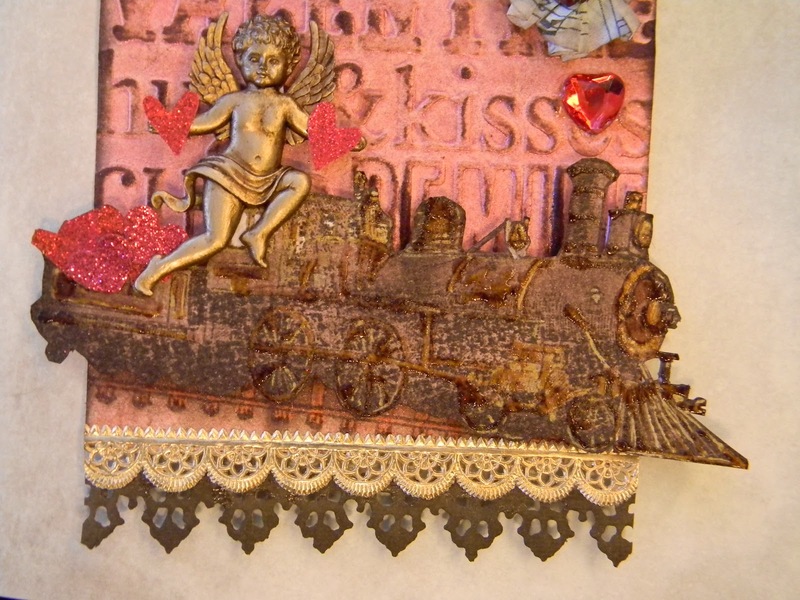 That little cupid looks like he's having the best train ride of his life! Love Cupid going for a train ride and passing out those love hearts! Great job improvising on the honeycomb heart, which looks wonderful! Have a great weekend! I think your heart is PERFECT! What a great take on the Feb tag. How did you stamp/color the train? It looks heat embossed but I can't tell.